" Hiking in the North Cascades is, without a doubt, some of the best in the world.."
Aside from fishing, there is a multitude of other activities to enjoy. 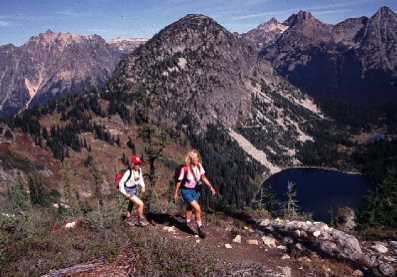 Hiking in the North Cascades is, without a doubt, some of the best in the world. If great mountain biking is what you're up for, it's hard to beat the trails in the valley. Don't forget to bring your golf clubs - the local golf course provides a great challenge, as well as gorgeous views. Horseback riding over the beautiful hills of the Methow is always a excellent option for the family. Whatever your needs, North Cascades Fly Fishing will point you in the right direction.